Back in the 1980’s, the blues music pot finally came to a boil. The music had been placed on the back burner for a decade or so it seemed. However, it had been simmering for some time, as small pockets of like minded young musicians were getting together to play blues music in front of small audiences in the age of arena rock histrionics. These musicians created little scenes in communities across America and elsewhere. 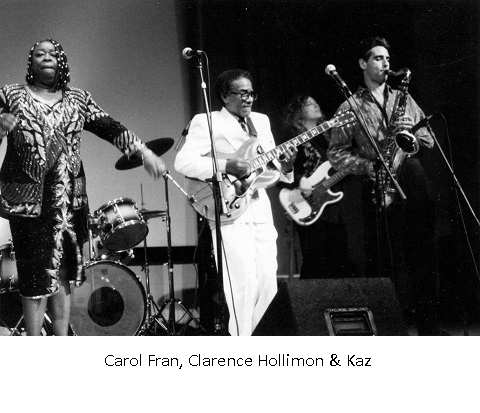 Before long, blues nightclubs sprang up overnight and independent blues labels started to emerge. It could be argued that no city had more live blues music than Austin, Texas, and no independent label put out as much consistently exciting material as Hammond and Nauman Scott’s Black Top Records. 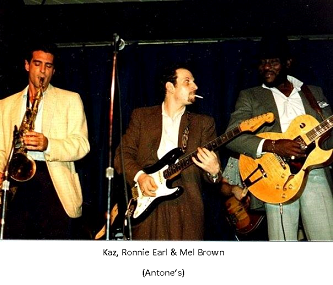 At the nexus of this red hot explosion of blues was the ubiquitous presence of a young musician named, Mark Kazanoff, universally known as “Kaz.” He was in the house band at the famed Antone’s nightclub in Austin while serving as the “in-house” sax man for the Black Top label. By 1987, Clifford Antone had his own record label and you could find Kaz on those records as well. He also played on recordings released by Bruce Iglauer’s Alligator Records out of Chicago. It seemed like you couldn’t buy an album where Kaz was not playing either tenor, alto or baritone sax, often all three. On these records he was probably doing the horn arrangements and may even be the album’s producer. He might even be playing the harmonica on a track or two. 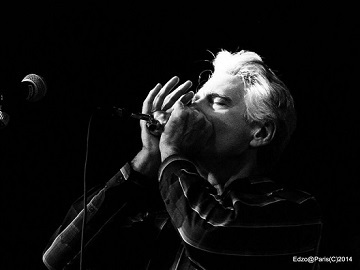 That blues revival lasted throughput the decade of the 90’s and saw a dramatic cooling off in the economic, cultural and social milieu that took place in the wake of 9/11. The size and strength of that revival, along with a new and determined generation of musicians, has kept the blues fires burning. Kaz is still a first call musician and still making great records with the best blues men and women in the business. He also represents a bridge back to the post war blues giants who inspired him and he himself played with, back in the day. I thought this would be a perfect time to visit with a man who is a junction to the history and the future of the blues. Read why in my conversation with Kaz. David Mac (DM): Let me start out by asking a question I have always wanted to ask. Do you have any idea as to the sheer number of albums in which you are associated, either playing sax, harmonica, as a producer or any combination there in? Mark “Kaz” Kazanoff (Kaz): That’s a good question. I lost count about ten years ago when it was over 200. So I am guessing somewhere around 230-240. The number has gone down a little bit in recent years from back in the Black Top days. Back then I was making about a record a month. By the way, I just saw Hammond (Scott) last month when I was in New Orleans with my son. We had a wonderful visit. I hadn’t seen him in ten years or so. It was real great to catch up with him. DM: Is he still in the music business? Kaz: No... He’s pretty much done with that. He has three wonderful children and that is at the center of his life. DM: Let’s back up a bit and start at the beginning. In doing my research, I discovered that you were born in North Hampton, Massachusetts, in 1949. I thought it best that we at least start by getting our facts straight. Kaz: That is a fact, although some website has me being born in England which of course is erroneous. Kaz: You got it right; North Hampton, Massachusetts...but I grew up in Vermont. DM: Do you remember some of your earliest exposures to music? Kaz: I do. While my mother was a student at Bennington College in Vermont her campus job was working for this professor, Stanley Edgar Hyman. He was, aside from being a famous literary critic, one of the preeminent jazz and blues record collectors in the world. I remember going over to his house with my mom. It was one of these big ramshackle country homes out in the boonies. Every wall, in every room of this big house was covered with blues and jazz records. I’ve never seen anything like it. Her job was to collate and create index cards for all these recordings. So every week she would bring home a dozen or so albums and we got to listen to them. He had everything from Bix Beiderbecke to Louis Armstrong to Son House to Blind Willie McTell. I mean this guy had absolutely everything. So for me, that was music. That was all I heard, jazz and blues. It wasn’t until much later that I found out that there were other kinds of music. DM: That’s amazing. For most people, this music that we love is not something that we are surrounded with at a really young age. It is something we have to go seek out. It doesn’t come to us. Kaz: Not much live blues anyway. I didn’t really start hearing live blues until we moved to Boston when I was twelve. It was then I discovered that there were other people in the world who were actually listening to this music. Then I discovered there were others actually playing it. Kaz: While in high school I met relatively like minded individuals. We formed little bands and played different types of blues and folk music. These guys of course had their own record collections and turned me on to the stuff they had. DM: I have read that you started out playing harmonica. Was there a particular musician or recording that served as an early inspiration? would come home from school every day and put that album on and work on every song on the record. I literally wore the album out to the point it wouldn’t play anymore. I had to go out and get another one. Kaz: Oh yeah, it was but I was also listening to Sonny Terry, Sonny Boy, Junior Wells and others, but that Little Walter album was the most important and the biggest one for me right from the beginning. Then a couple of years later he came to Boston. He played at this kind of strange little coffee house place. I went down there to see him every night. DM: You ended up going to college in Chicago. Let’s talk about that experience. Kaz: First of all I chose to go to the University of Chicago because I knew that’s where I wanted to be. I had seen Muddy, Spann and Wolf when they came through Boston. Of course I knew they lived and worked out of Chicago so that’s where I wanted to go. Kaz: (laughing) exactly or ‘University of Chicago just down the street from Pepper’s Lounge.’ I was going out a couple times a week to hear live music. I heard Magic Sam, Wolf, Hound Dog Taylor, Junior Wells, Lefty Diz and others. I quickly met up with other like minded musicians, eventually ones who had vehicles. That was a very important factor when you are going out to hear music on the South Side of Chicago. It didn’t take me long to get into the music scene in Chicago. I would go out to Maxwell Street every Sunday, which I loved. DM: What a wonderful rich history that you were able to experience firsthand. Kaz: I have that great coffee table book about Maxwell Street with all those old photographs. I pull that out every once in a while and it jogs my memory as to all the wild stuff I used to see there. DM: So you were getting two musical educations at once in Chicago. Kaz: That’s right; I eventually became a Music Major at the University. So I learned a lot there. Years later, after I moved to Austin, I went to the University of Texas and got my doctoral degree. I know a lot of theory; you know nuts and bolts stuff. In fact I have been teaching music theory for twenty years at Saint Stephen’s Episcopal High School in Austin. I just graduated my third child from there. Kaz: I am going back next year and it will be the first time in a very very long time that I haven’t had one of my kids there. It has been a wonderful gig. I have really enjoyed teaching there. The students have been great. DM: Back to when you were a student in Chicago, I suspect you were getting out and playing as well. Kaz: Oh yeah, I was starting to sit in and meeting some of the musicians. I was only playing harmonica back then. I didn’t start playing saxophone until I was out of college, which is kind of weird. I wish I started earlier. I was singing and fronting my own bands around campus. Every once in a while we would get a club gig, but it was mostly parties. We had a real good band with some good musicians. DM: Is there anybody in particular you would like to mention who you were playing with in those bands? over the country. He has put out three or four wonderful CDs of his own music. You would love his stuff. DM: Let me stop you right there. Is there some kind of Vermont/University of Chicago connection of which I should be aware? Bernie Sanders, the United States Senator from Vermont, who is making some headlines these days, is a graduate from the University of Chicago? Kaz: (laughing) It is kind of strange that all my friends from Chicago it seems moved to my home state, or what I think of as my home state. Clyde Spats is a terrific bass player, who was in our band, also lives in Burlington. DM: You have become largely associated with the tenor saxophone. What was your motivation to pick up that instrument? Kaz: My first sax was actually an alto which I picked up at Lion and Healy Music for $250. It is a beautiful Selmer alto. It’s a wonderful horn. I started playing that. So I got a tenor and two weeks later I showed up on a gig with the tenor and Johnny said, “Hey great, bring it on up here.” I told him that I have only had the tenor for two weeks, I don’t really know a lot. He said, “You know where the notes are.” I said, “Yeah.” He said, “Well then, just find one good note.” So honestly that has been part of my musical mantra for my entire musical life...‘JUST FIND ONE GOOD NOTE.’ So that was the beginning. From there I took lessons, but I really learned on stage more than anything else. DM: Let’s talk about the Boston to Austin connection. 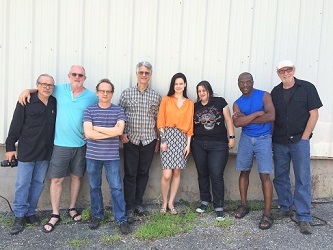 Kaz: Besides myself and Johnny Nicholas there is the bassist Sarah Brown, who is a fine example of that Boston to Austin connection. In fact, Sarah and I are going to be doing some playing this summer. The Texas Horns have sort of a residency, house horn section gig at the Ottawa Blues Festival. It is a big two week-long event. This year the head guy at the festival asked me if I could put together a core house band from Austin for the last week of the festival. We are going to be doing blues night, each night in the theatre at the festival site. 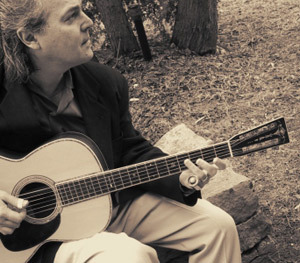 I’m taking guitarist Denny Freeman and pianist Nick Connelly up with me along with Sarah. DM: When did you move to Texas from New England? our drummer. We drove down here and did some gigs and ended up staying for three months. We did some gigs with The Fabulous Thunderbirds, Asleep at the Wheel, Marcia Ball and a lot of other great musicians. I thought ‘what a great place’. I wanted to move here, but it wasn’t until 1981 that I made the move. I got a call one day from Fran Christina. 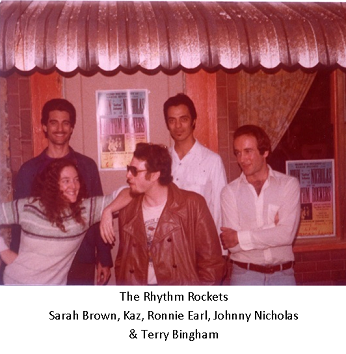 He was the original drummer with The Rhythm Rockets before joining the T-Birds. He told me that Marcia Ball was looking for a sax player. So I packed up my car and drove to Austin. I played in her band for three years. It was a wonderful experience. We are still friends and I still play with her quite often. That kind of got me going. It seemed like as soon as I moved here I met Susan and Clifford Antone. They were just so incredibly welcoming. Clifford would say, “Hey, anytime you want to come down to my club and play, just come on down and play.” It was just so wonderful that they would treat someone like that just based on their musical background and experience. Black Top sessions about once a month or so. DM: There have been a few iterations of the nightclub through the years. They were downtown and then up on Guadalupe before moving back downtown. I suspect you have played at all of these through the years. Kaz: That’s right. 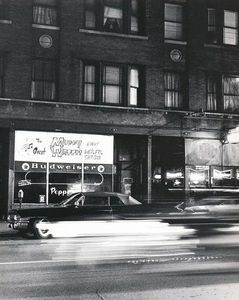 I played at the very first location on 6th Street downtown a few times. 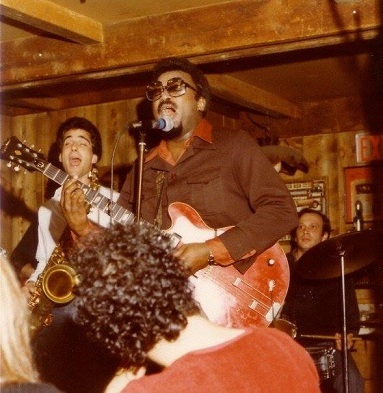 I actually played with The Rhythm Rockets at that original location in 1978. We backed up Big Walter Horton for a week. DM: The Antone’s brand has become a big part of the Texas tradition which you were a big part of, but there is another wonderful tradition of Texas sax players that goes way back. Are there any of these giants that you have latched onto musically? Kaz: Absolutely! There are certain musicians that I have encountered here. Two come immediately to mind. One is Arnett Cobb who, as you know Dave, is an absolutely wonderful tenor player out of Houston. I got to meet him years ago. I got to hear him live a bunch of times and even got to play with him a couple of times. He was just such a wonderful guy and a terrific blues and jazz player. He was a big influence on me. The other is David “Fathead” Newman out of Dallas. I got to meet and record with him. We got to play some gigs together. He too was a big influence. Through the years I would go through different stages getting into people like Don Wilkerson who worked out of Houston. I got to play a lot and record with Grady (Gaines), another great tenor player from Houston. Joe Houston was originally from Austin. You had Ornette Coleman out of Fort Worth, who just passed away yesterday. I mean I don’t aspire to play in that style, but I dig his music. DM: You mentioned Hammond Scott earlier. Maybe it would be time to talk about your work with his label, Black Top. How did that association come about? Kaz: That actually happened very early on in the label’s existence and not long after my move to Texas. 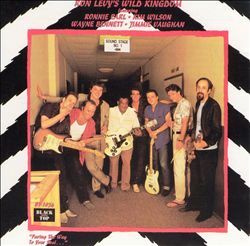 I still had pretty strong connections with Ron Levy, Ronnie Earl and others from the New England area. Hammond Scott wanted to record Ron and Ronnie. So my first two records I played on with Black Top were with them. Hammond and I hit it off immediately. Back then I was doing all the horn section stuff myself. I would lay down the tenor part, then overdub the baritone part and the alto if it needed it. I very quickly became the house horn guy for the label and it was result of those first two or three records I did. DM: They were doing most of the recordings in New Orleans were they not? Kaz: That’s right, but that first Ron Levy’s Wild Kingdom album was recorded here in Austin. They did make most of their records In New Orleans, but after awhile and they were doing more recording here in Austin, not just because I was here, but there were so many good musicians here to work with. We ended up recording W.C. Clark’s records here, an Earl King album here and others as well. DM: Just for point of reference, that iconic blues label’s first release was a 1981 album by the Dallas based band Anson Funderburgh and the Rockets. You have made simply wonderful contributions to some of Anson’s albums. Kaz: I made at least three or four albums with Anson including that great album Sins which was the second record he made with Sam (Meyers). Actually, I will be playing with Anson this summer. I am really looking forward to that. I have already been in the studio with him a couple of times this year on a couple of records he produced and he is playing guitar on the new Texas Horns CD. He came through town with Mark Hummel and Charlie Baty not long ago and I got up and played half a set with them. We had a great time. It was just a beautiful gig. Wes (Starr) on drums...it was just fantastic. DM: I have always been a huge fan of Anson’s playing. Kaz: Oh yeah, he is one of the God’s of the planet. He’s a great guy as you know. He is a dear friend and I love playing with him. DM: There are just so many we couldn’t possibly cover them all, but are there any recordings you did with Black Top that stand out in your mind or experiences you would like to share with our readers? Kaz: Like you said Dave, there are just so many, but those Earl King sessions were pretty special. He was such a poet and creative genius. I just loved being around Earl. It didn’t matter if it was in the van, at that chicken place in New Orleans he liked, on stage or in the studio. I always thought that Earl should have been the poet laureate of the United States. I loved working with him because his music was just so creative. When we were in the studio a lot of times he would get with me and say, “This is kind of what I want for horn parts.” He would sit there and work them out on his guitar. We would discuss where he wanted the horns to go on each tune. It was a real collaborative effort working with him. I think the results are spectacular. I really love those CDs. Hard River to Cross is still one of my favorite CDs of all time. Another one that was kind of magical was the James “Thunderbird” Davis CD. It was just one of those times when everyone came together and everyone was in a great mood. The material was great. There are a lot of sessions that were like that though. I mean Anson’s were great like that. The sessions with Big Joe Maher were fantastic. DM: Records like Fear No Evil you did with Robert Ward helped to define the Black Top brand. He was a guy that was the founder of a band that would eventually become The Ohio Players. He was even a session guitar player with Motown in the early 70’s; a really innovative guitarist and great singer, yet he didn’t make a record under his own name until 1991 at Black Top. KAZ: I thought the Robert Ward stuff was just really, really cool. 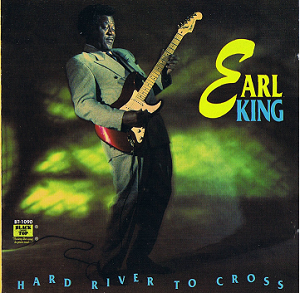 Like Earl King, he had such a vision of what he wanted his songs to sound like and what he wanted the band to sound like. When you got with him in the studio it was like everybody hopped on the same band wagon. Everyone was heading in the same direction. It really was an amazing experience to be with him in the studio. He was such a cool cat. There are just so many...Mike Morgan’s CDs were fun to make. Then later on there was W.C. Clarke’s CDs which I had a hand in producing....again just so many. DM: I don’t make a huge distinction between jazz and blues and some of my favorite music is when all these things get mixed up anyway, but let’s talk a bit about the jazz side of things. 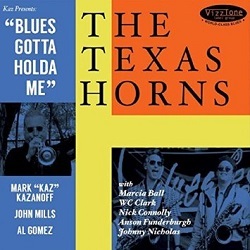 Kaz: Some of the tunes for instance on the Texas Horns CD are jazzier. I am kind of like you, in that if someone came up to me and asked me to define the difference between jazz and blues, I would be completely at a loss. I don’t know what the difference is and I don’t want to know. If you go back to the Black Top stuff, there are a lot of jazzier tunes. Take the Snooks Eaglin CDs. Snooks always had a couple of jazz tunes or what people would refer to as jazz tunes on his records. At the time nobody was worried about what you called something. Nobody was saying, ‘Hey you can’t put a jazz tune on a blues CD.’ Nobody thought that way. We would just follow our muse and try and play where you are at in your life. I still feel the same way. DM: It is one of the things that made those records so cool. 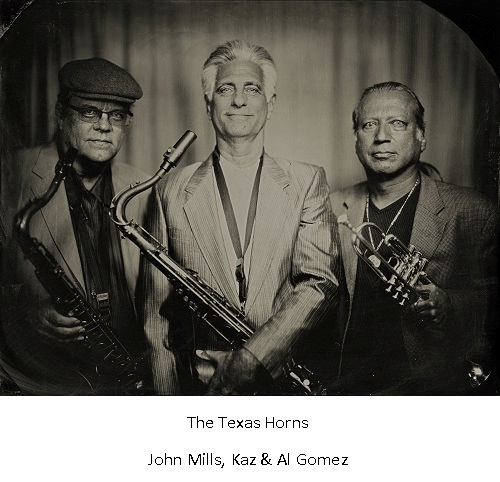 Take the new album Blues Gotta Holda Me by The Texas Horns. You have Your Driving Me Crazy. That is a straight ahead jazz standard. Kaz: Exactly! That is an old Moten swing tune from the Kansas City days of Count Basie. I just never cared what people are going to call it or how they react to it. I will tell you though, despite the fact that I play jazz gigs in Austin, I don’t really consider myself a jazz musician. There are lots of musicians who have dedicated themselves more thoroughly to playing jazz. DM: Let’s talk about the new album starting with your fellow horn players. The trumpet player is Al Gomez. I first became aware of his playing when he was with Doug Sahm back in the day. That’s how I met Al and Rocky (Morales) As soon as I met Rocky I totally fell in love with the guy. As soon as I heard him play, I knew this guy was going to be one of my buddies and mentors and models and pals forever. We were really close friends up until he died. He really was simply incomparable. We talked about Texas tenor players a bit ago; I should have included Rocky in there. DM: I have always had a great affection for Doug’s muse and to me it represents as much as anything that eclectic nature of Texas music. Kaz: Oh yeah! You have that whole jump, swing, r&b thing that came out of San Antonio. That was a heavy place. It was as heavy as Dallas, and even Houston, as far as the quality of musicianship is concerned. I made a couple of records with him. He was very cool to work with. DM: Let’s talk about the other sax man on the record John Mills. Kaz: John is an incredible musician. He plays all the saxophones, clarinet and is a master flute player as well. He also plays piano and is a world class arranger. He is really a master musician. He also writes music. You might want to check out an ensemble called John Mills Times Ten. He has two CDs out. The musicianship is really strong. He is a professor at the University of Texas. He speaks five languages. He is an incredible guy to go on the road with. No matter where we go, John can speak the language. DM: You also have a bunch of great musicians as the core band as well as some special guests. Kaz: That’s right we have Barry “Frosty” Smith on drums and guitarist Derek O’Brien who play on all tracks. It is a long list of players who make great contributions but we have Ronnie “James” Webber, Johnny Bradley and Roscoe Beck on bass. Danny Levine and Nick Connolly play piano on various tracks. Nick plays B3 on some tunes and sings as well. It was great to have Marcia Ball singing and playing piano on one song. W.C. Clarke contributes vocals on a tune. We are also joined by a couple of others whom we have talked about, Anson guests on guitar and Johnny Nicholas is on the album as well. So we were really lucky to get such great musicians and guests to come in on the various sessions. It all worked out well. I always had a picture of what a Texas Horns CD would be and this even went beyond that picture. DM: Let’s talk a moment about Frosty. How is he doing? Kaz: He is doing OK. As you may know he had a stroke back in December. I talked to him a couple of weeks ago. He is very positive and upbeat. He even has started playing again. He is working on getting his chops and stamina back. When we started tossing around people of who we wanted to get, Frosty’s name was always at the top of our list. DM: As I listen to the record I think for you this is kind of like a family reunion. From Johnny, Marcia, Derek, Anson and others, these are the people you have been recording with for so many years and it kind of came full circle. Kaz: That is very true. I should also mention our engineer, Stuart Sullivan. We were talking just the other day and trying to figure out how many sessions we have done together; it was OVER FIFTY. I don’t think either of us realized just how many we had done together until we started adding them up. Stuart worked really hard on this record. He put a huge amount of his knowledge, expertise and soul into the Texas Horns CD. DM: There is another vocalist present on the album we haven’t talked about. Kaz: (laughing) You just had to bring that up, didn’t you Dave. That’s it, this interview is over. DM: Good night everybody. You don’t have to go home, but you can’t stay here. Please remember to tip your bartenders and waitresses. Kaz: (laughing) I have always been a very sheepish vocalist through the years, but I do love to sing. There is a funny story related to all of this. I got done with one of the sessions and it was one that I was singing. It might have been Lost Mind or You’re Driving Me Crazy. I called Marcia and I said, “I’m happy to be singing. I feel I can carry the notes pretty well. I can carry the tunes and I know I can phrase OK, but I just don’t like the sound of my own voice.” Then after this wonderful comedic, pregnant pause she said, “JOIN THE CLUB.” Think about that though; I mean what musician really likes the sound of their own voice? DM: (laughs) Join the club, that is beautiful. As it turns out you are singing on four of the album’s thirteen tracks. While listening to the album I recognized the other vocalists Marcia, W.C Clark, Nick and Johnny, but there was this one voice I didn’t recognize. I thought this cat is pretty good. It is a part of the recording and so often these days it seems like the vocals are just an afterthought if any thought went into that aspect of the recording at all. Kaz: That is a good point. Take Jimmie Vaughan who is a great example. I remember Jimmie when he would never sing anything. He has turned himself into a real solid singer through the years. DM: I agree. You mentioned that you love to sing, but you haven’t done a whole lot of that at least to my knowledge. Kaz: I used to sing a lot when I was younger, fronting my own bands, but then I started working with great vocalists like W.C. Clarke, Angela, Marcia, Johnny Nicholas and others, I felt like I didn’t need to sing. Once again, I would like to credit Stuart Sullivan for making me sound good on this CD. DM: The other aspect of this CD I love is that it is a “horncentric” blues record, if that is even a word. As far as I’m concerned, we could use more of that in blues. Kaz: I obviously agree. There are certain things horns can do...well let’s take the Curtis Mayfield tune we do on the album, People Get Ready. That style of a presentation of a song you can only get with horns. You also mentioned coming full circle. That not only relates to the musicians obviously, but the songs themselves. Not only are there originals, but it was important to have an Earl King song, a Percy Mayfield, a Louis Jordan tune. These are the musicians who were important to me as I was growing up and growing into the music. So I feel very fortunate to be able to pay tribute to them on this CD. DM: What’s on your immediate musical horizon? Kaz: I am going to produce a record for an amazing young female singer from Finland. DM: Ina Forsman? I have her first record she did with a terrific Finnish harmonica player named Helge Tallqvist. Kaz: As you know, she has a real good voice and has a pretty deep understanding of the music. Even though she is really young, there is a maturity there. I like where she’s coming from musically. I am very impressed. We have been emailing back and forth and she is really knowledgeable. She is coming out here this summer to make an album. It will have a lot of Texas Horns stuff on there as well. DM: How did you find Ina? Kaz: Thomas Ruf of Ruf Records out of Germany put me in touch with her. I have known Thomas for some time as I produced a Candye Kane album years ago that he put out on his label. DM: This might be a good time to talk about Kaz, the Producer. What are some of the things you think about and try to bring to the table in that role? Kaz: Being a producer you have to wear a lot of different hats. Often, when I am a producer I am also an arranger. So I get very involved with the lyrics and song structure. What is going where and what type of instrumentation will work on a particular song. I spend a lot of time with all of that even before the session starts and of course during the actual sessions themselves. You are constantly trying to balance the tunes on an album in terms of tempo and style. You are always trying to find the right material and what direction you take that material. As producer you have to be able to pick the musicians themselves for a particular session. You have to have a good feel for people’s various styles and how they will work together with other musicians. How supportive will they be with other artists? It is pretty complicated. I have been doing this for over thirty years now and I feel like every session I do I get a little better. I mean nobody ever taught me how to do it. I did learn a lot from Hammond Scott. It is just something I started doing. DM: Outside of the world of blues, soul and rhythm & blues, what interests or hobbies do you have? Kaz: Actually it is other types of music. I have been listening to a lot of Cuban music over the past ten years or so and have been acquiring a lot of Cuban music CDs. I had a chance to go to Havana two Decembers ago for ten days during the Havana Jazz Festival. That was just an incredible experience. I really loved it. So I have been branching out and listening to a lot of African music and to some extent Brazilian music. I’m certainly no authority on those types of music. Musically, I feel like I am still reaching out and still growing. I feel like there are a lot of frontiers that I would like to explore. DM: It is what keeps you young. Kaz: Yeah... absolutely. I would like to mention that my dear friend David Maxwell, who was a wonderful piano player and songwriter from the Boston area, passed away not too long ago. He was actually a big influence on me, as he was really into Indian music and different types of African music. He kind of paved the way for me. He made me feel like it was OK to listen to different types of music. It was OK to kind of branch out and still be able to call myself a blues musician. DM: It was about year or so ago I did an interview with Jimmie Vaughan, who you mentioned earlier. He talked about how he draws inspiration and ideas from all kinds of music. We spent a lot of time talking about tenor sax players for instance. Kaz: While we were riding on the bus, all we listened to were tenor sax/organ trios. DM: I’ll bet you heard a lot of Gene Ammons. Kaz: Oh yeah...That’s one of his big favorites. I love that stuff too. I still love doing gigs with Jimmie. He’ll call me out of the blue and say, “Hey man can you play a weekend with us?” If I can do it, I’m there. I love his other two horn players, sax man Doug James and trombone player Mike Rinta. They are great, great musicians and wonderful players. I can slide right in and fit there between those two guys. DM: You have a singer from Finland coming to Texas. You mentioned Mike Rinta. He is playing at an American Soul Music festival in Porretta, Italy, this month. Let’s talk about your experiences taking this American music to Europe. Kaz: Last November I went to Europe with a Dallas based singer and guitarist, Andrew Jr. Boy Jones. I hadn’t been to Europe in quite a while. Over there, because of my association with Black Top Records as well as my connection to Antone’s Records, there are quite a few people who were aware of those labels and aware of my work on those records. A lot of people came out to the shows and would come up to talk to me. Some people even had some old Black Top vinyl that they wanted me to sign. I thought that was pretty amazing. DM: That doesn’t surprise me, as there seems to be a real reverence for blues music in Europe, especially with young people. Kaz: That is so true. There is some real good music going on over there at a really high level. There are a lot of musicians who have really learned the blues and have taken the music to heart. They seem to really have it together over there. It happens over here as well. I think there are some younger players who are coming up here who are interested in learning about blues and rhythm & blues and some of the older styles of music. My son and the musicians he plays with, they love the old stuff and can’t get enough of it. DM: That is wonderful. You certainly are in a unique position and have a terrific point of reference on this subject having been a high school teacher for the past 20 years. Kaz: It makes me happy when they discover Ray Charles or Fats Domino or any of the older stuff. They are even listening to Bix Beiderbecke. I think that there is a real strong contingent of young musicians even here in the states who are getting into the real thing. DM: As an educator you have been in a position to have an impact of the future of this music. Kaz: Thanks for bringing that up. I actually started the jazz band at the school. I have also been teaching a class called American Soul that traces the history of the music all the way back to slavery on up through the great woman blues singers of the 20s all the way to Chicago and beyond. I do that class every other year and balance that with a class I teach in global music, where we focus on the music of India, Africa and Cuba. 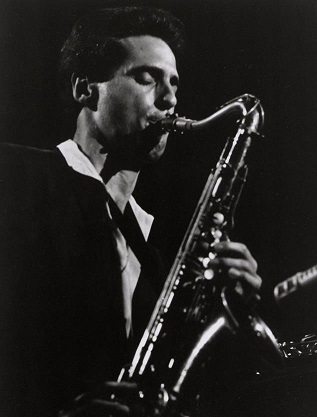 I still teach a class in saxophone when my students get more advanced, I turn them on to Charlie Parker, Coltrane and Dexter Gordon. I also turn them on to the blues players, some of whom we talked about earlier. DM: Are your students aware of your stature in the music business? Kaz: They know I am a professional musician and I try and help them when I can. For instance my son plays in a terrific band. They were writing songs and wanted to go into the studio. So I brought them in and produced a record with them. I had Stuart Sullivan. It was a pretty amazing experience for them and for me as well. They are all really strong musicians and knew what they wanted to do and were ready to go. It was very cool. DM: It doesn’t get any better than that Kaz. Thanks so much for your time today.